Looking back, with the clarity of hindsight, we chose the wrong route down. To descend from the top of Europe in the dark, with winds that had us stumbling and crawling off the mountain, was chaos. 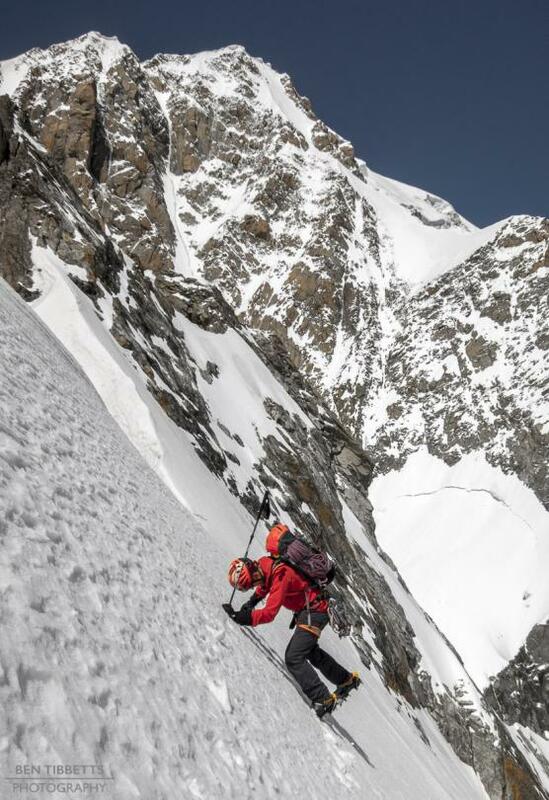 But to choose the quickest way down was to miscalculate the balance – the crush of fatigue versus the danger of steep slopes loading with snow. We had begun in the Aosta valley, in Italy, 39 hours earlier on a route known as the ‘Peuterey Integrale’, the longest climb in Europe, with 4500m of technical terrain. 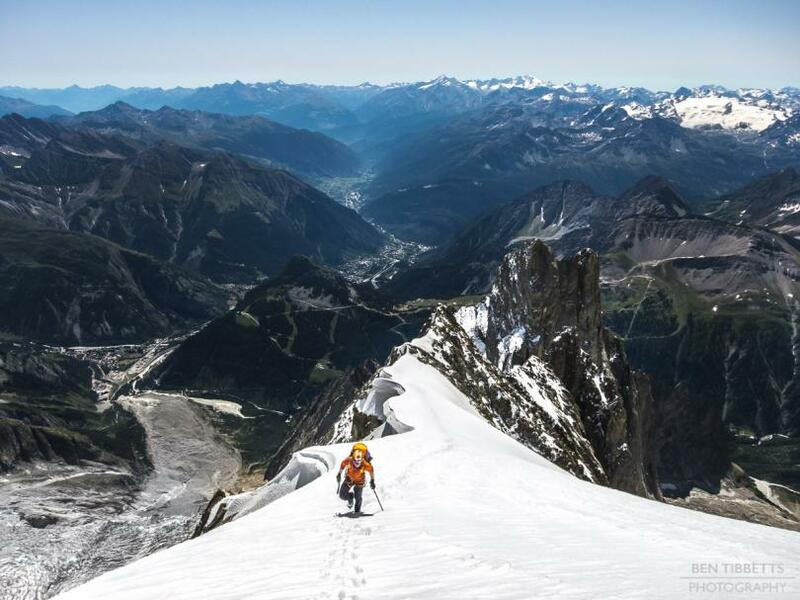 It was however the home run, the ‘3 Monts’ back to the Aiguille du Midi that proved to be the crucial passage. 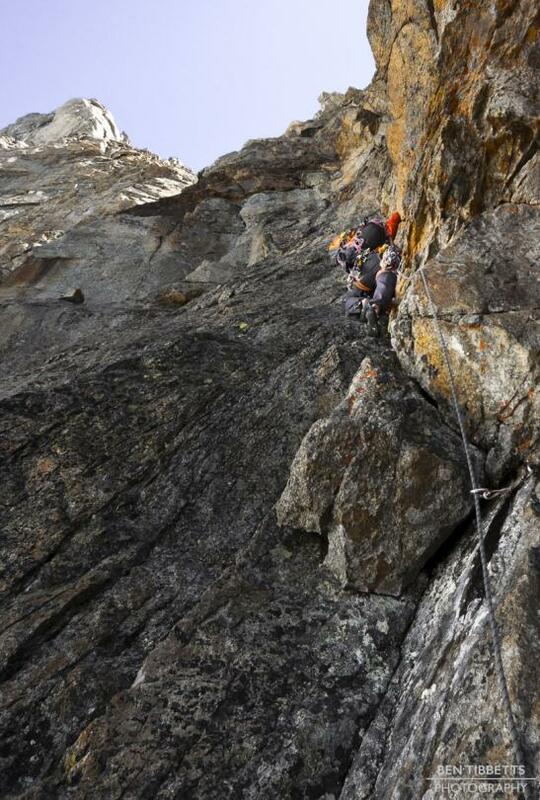 The first section of the climb, the Peuterey Noire, was already a 1000m high TD ridge. We started up in the dark. At the very base there were a few footprints, and at the edge of the glacier we found a pair of crampons, presumably left by accident. That probably provided an interesting story for a team somewhere on the ridges above us. It was the first time Ally Swinton and I had climbed together and neither of us knew a great deal about the route, other than it was long, complex, and that most people took three days with bivouacs along the way. It also seemed rather difficult to escape along the way should you run into difficulties. The rock climbing was excellent, with sustained interest along the whole ridge, and a few passages made more tricky by our reasonably solid backpacks. We carried light crampons, a single axe each, some food, and a jetboil stove. No sleeping bag, no mat and only enough water to get us up and over the first peak and down to hopefully find some ice to melt. Towards the summit of the Peuterey Noire however we were slowed considerably by snow, making the easy rock climbing into insecure mixed ground. We reached the summit in the early afternoon and began the 14 abseils directly from the virgin. This was the first section we had been warned about. 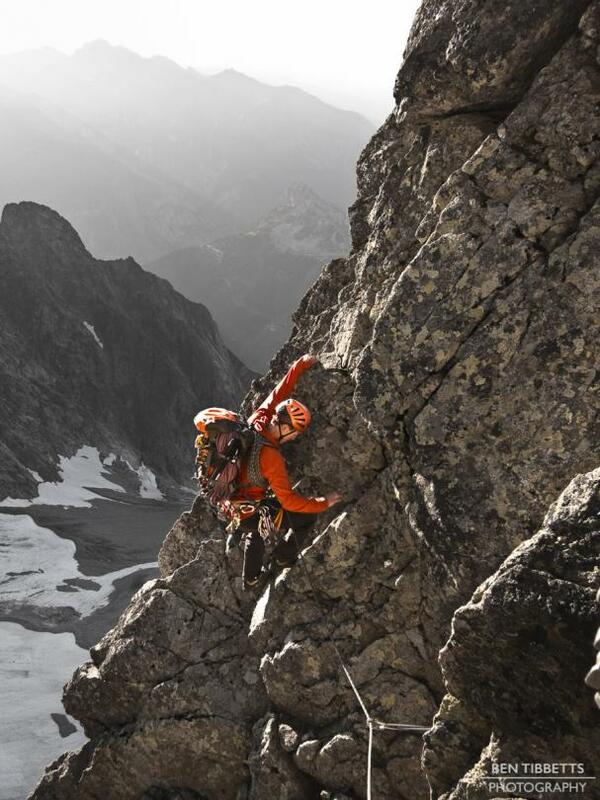 The series of abseils takes you down a 400m vertical wall of slightly loose granite. Each abseil station needed thoroughly jump testing and a couple we rejected and had to bounce around at the end of the rope in search of something better. On pulling one abseil, a rope got stuck and we had to re-climb the rope to free it. We were parched, having run out of water some hours earlier, but not wanting to stop and melt water in daylight. We found a seepage of trickling water at about the 8th abseil and filled our bottles. The descent topo is difficult to follow, but eventually we arrived at the ‘Les Dames Anglaises’. This section is etched in my mind. Never have I climbed on such terrible rock without any option but to continue. In this section everyone’s previous descriptions become muddy. The image above is from the next day looking back at the Peuterey Noire and the Dames Anglaises. The abseils follow the line of sun + shade from the highest point and the Dames Anglaises are the lower peaks in the middle-ground. The terrain is complex, yet the features are ill-defined. Ridges, chimneys, ribs and ledges merge and muddle as the mountain disintegrates. Though we knew which direction we needed to go we didn’t find a good solution and became vaguely lost as the light faded out. The night passed slowly trying many options, wasting our time and energy trying to match the terrain we couldn’t see to a route description we couldn’t understand. As Ally described it “you have arrived in hell’s kitchen, your only hope is that you’re not on the menu”. We climbed unroped but close together for much of the traverse. There was nothing much to anchor to, but lots or rock to knock off onto each other. We planned to climb the route nearly continuously, with a short break to brew up at the Craveri Bivoauc shelter. 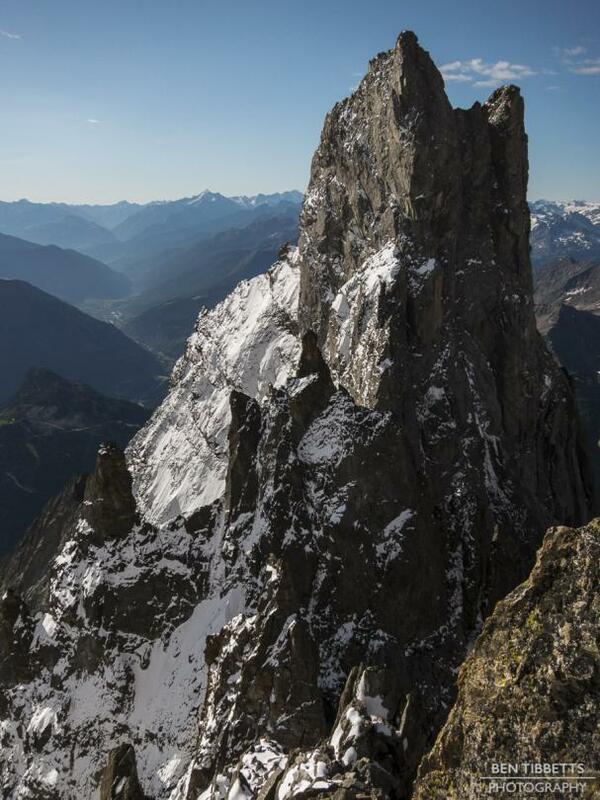 This sits in a magnificent, though severely exposed location at the north end of the Dames Anglaises peaks. We were thankful to be back on route, but it was 2.30am, and we were much later and more tired than we had hoped. We brewed up some drinks and noodles and took a power-nap for a few hours before setting off again at daybreak at 5.30. At this point we thought we would still comfortably be up and over Mont Blanc, and down to the Aiguille du Midi to catch the last lift down to the valley. More importantly we wanted to get down before the forecasted storm rolled in. 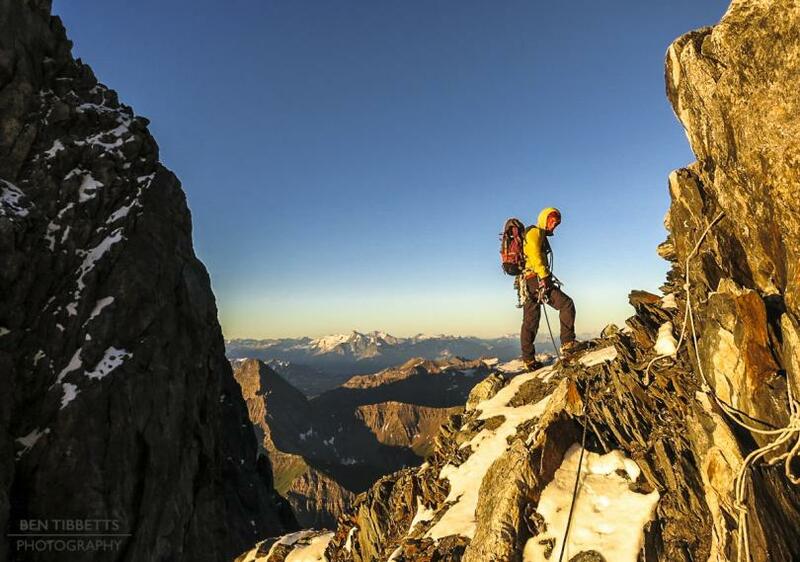 The terrain up the Aiguille Blanche de Peuterey is amenable and even enjoyable. However with a lot more fresh snow that expected, we moved slowly. Between the two summits of the Peuterey Blanche is the beautiful yet exposed ‘half moon’ snow crest. The snow was still good, so we moved unroped. Towards the far end however it turned to thin ice on rock slabs. We stopped to rope up and I led across. Ally’s axe only had an aluminium pick so was pretty worthless for climbing ice (He finally dropped and lost it a few months later when we were climbing the Gervasutti Pillar). After a few more abseils we arrived at the Col de Peuterey and melted some snow to drink. It was now mid afternoon again and the snow was soft. We followed a trail in the snow up the Grand Pilier D’Angle, the final peak on the ridge before Mont Blanc. However the footsteps were too soft to use and we broke trail easier to the side. The remaining passage of 800m of snow slopes and ridges pretty well finished us off. We were de-hydrated, fatigued and low on food. We both slowed down to a crawl up the final section though it felt good to be getting close to the summit plateau. 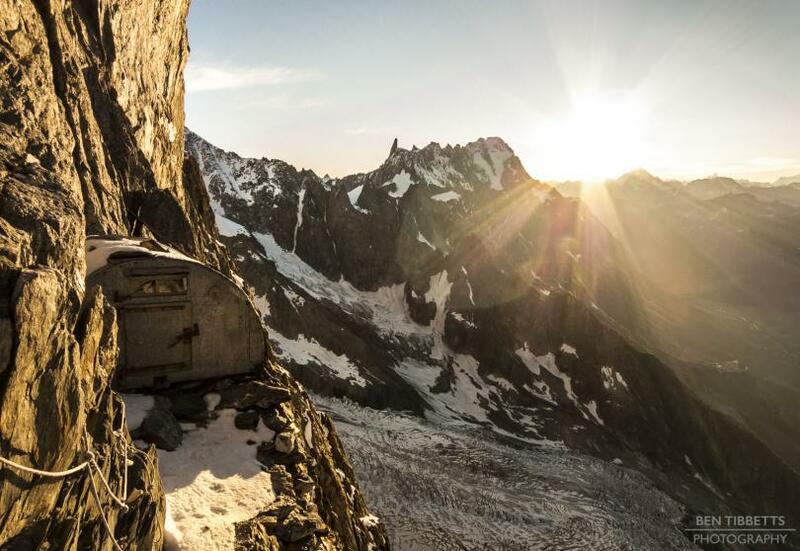 We had realised hours earlier that we would not make the last lift down that day so phoned some friends who stashed sleeping gear, gas, food and water for us at the Aiguille du Midi. Little did we know it would be another two days before the lift would run again! As we came near to the plateau the wind began to pick up. We felt exposed. It was late in the day and a bad storm was due to hit the area overnight. On the plateau before the true summit of Mont Blanc the wind was already raging and dusk fell as we stood on the summit. We didn’t take a photo. There was little to celebrate as there was clearly a lot more to come. We shook hands and had a quick hug. We had all our limited selection of clothes on, and it was time to descend, fast. We didn’t actually give much thought to descending to the Vallot which at 4362m, and without any sleeping bags would have been brutally cold, but in retrospect a much safer option. 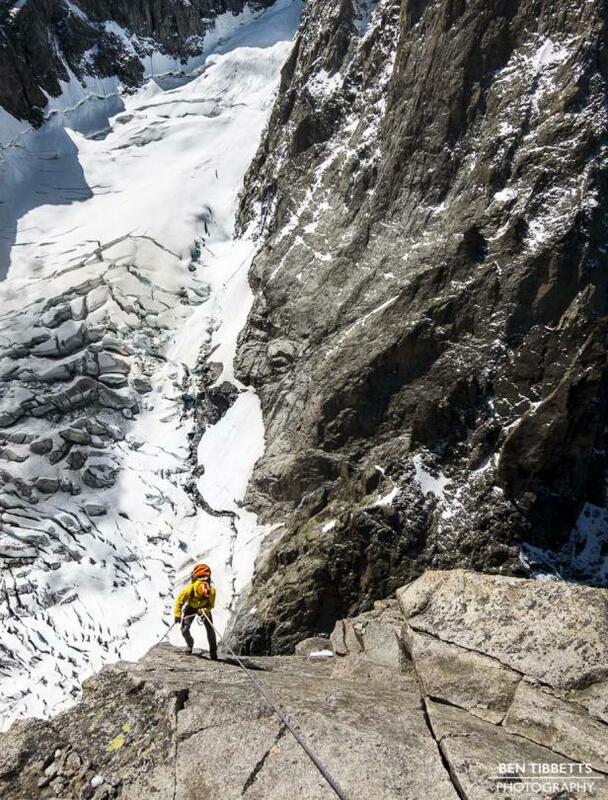 In the dark, with some passages of complicated route-finding, and several steep avalanche prone slopes, the route back to the Aiguille du Midi was a poor choice. By this time we were staggering around like drunks. Both because the wind was rattling us about, but also as we hadn’t eaten for far too long. We tried unsuccessfully to find some shelter to get food out, but eventually had to stop in the full force of the building wind. We dropped to our knees and huddled over our bags and had the last of our semi frozen water and food. At the Col du Mont Maudit we abseiled and down climbed off two bent ski poles, then roped up to descend the often crevassed north face. The wind was now raging from the north-west, rapidly cross-loading the slope with new snow. For much of this descent I led down as I knew the way quite well, but was hardly able to open my eyes as the snow whipped and stung my face, forcing itself into my mouth and choking my breath. We shouldn’t have been there, and knew well we were rolling the dice as we pushed ourselves down step by step against the swirling forces. Towards the bottom of the slope we found a macabre reminder of the tragic accident that claimed 9 lives only a week before. In the day time no-one would have noticed, but in the dark we stumbled towards a glimmer of light. It was a head torch still shining weakly under the snow, half uncovered by the wind. 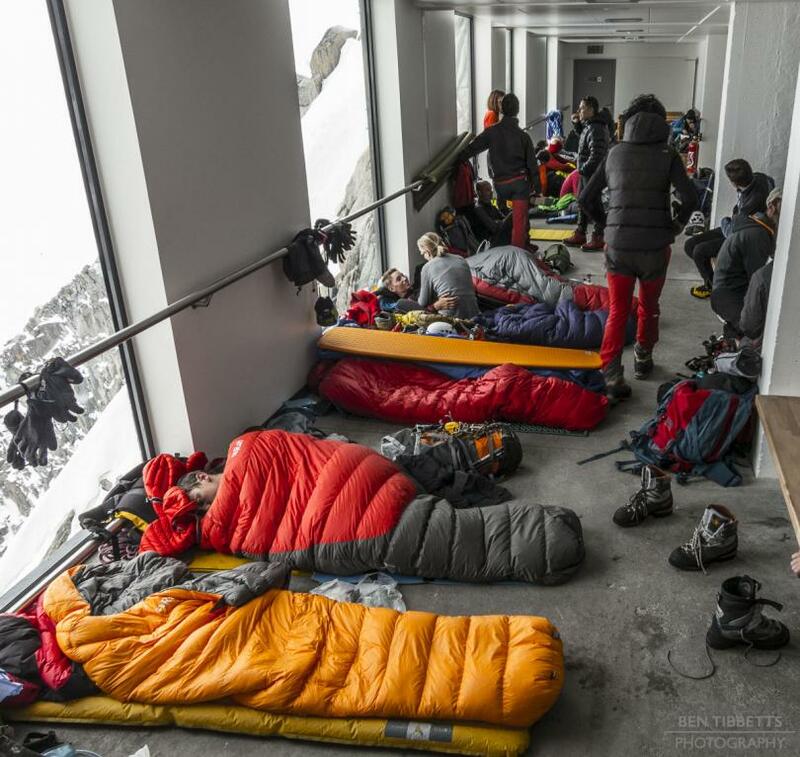 Hours later when we arrived at the Midi lift station we found out that it had been unable to run at the end of the day and that many late returning climbers were trapped up over night. We were ever so thankful to retrieve the gear and food our friends had stashed. We ate a little and fell asleep on the concrete floor. Again the next day the lift didn’t run due to the high winds, and many people traversed the Vallée Blanche to take the sheltered Helbronner lift down to Italy instead. Three hours walking was not on our menu so we sat out another day and night before descending.